Hand-made ceramic copy of a Greek Geometric wine cup from the 8th Century BC (see additional photos). Makes an impressive household decoration, or even an elegant pencil holder for your desk. This is a hand-painted reproduction, individually signed by the artist. It is not intended for drinking from or ingesting anything from. It is only for decorative purposes. Poseidon, (Roman name Neptune) was the god of the sea, earthquakes and horses. Although he was officially one of the supreme gods of Mount Olympus, he spent most of his time in his watery domain. Poseidon was brother to Zeus and Hades. These three gods divided up creation. Zeus was ruler of the sky, Hades had dominion of the Underworld and Poseidon was given all water, both fresh and salt. Although there were various rivers personified as gods, these would have been technically under Poseidon's sway. Similarly, Nereus, the Old Man of the Sea, wasn't really considered on a par with Poseidon, who was known to drive his chariot through the waves in unquestioned dominance. Poseidon had married Nereus's daughter, the sea-nymph Amphitrite. In dividing heaven, the watery realm and the subterranean land of the dead, the Olympians agreed that the earth itself would be ruled jointly, with Zeus as king. This led to a number of territorial disputes among the gods. 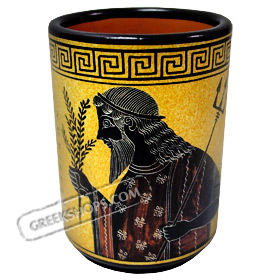 Poseidon vied with Athena to be patron deity of Athens. The god demonstrated his power and benevolence by striking the Acropolis with his three-pronged spear, which caused a spring of salt water to emerge. Athena, however, planted an olive tree, which was seen as a more useful favor. Her paramount importance to the Athenians is seen in her magnificent temple, the Parthenon, which still crowns the Acropolis. The people of Athens were careful, all the same, to honor Poseidon as well (as soon as his anger calmed down and he withdrew the flood of seawater with which he ravaged the land after his loss in the contest with Athena). Poseidon was father of the hero Theseus, although the mortal Aegeus also claimed this distinction. Theseus was happy to have two fathers, enjoying the lineage of each when it suited him. Thus he became king of Athens by virtue of being Aegeus's son, but availed himself of Poseidon's parentage in facing a challenge handed him by King Minos of Crete. This monarch threw his signet ring into the depths of the sea and dared Theseus to retrieve it. The hero dove beneath the waves and not only found the ring but was given a crown by Poseidon's wife, Amphitrite. Poseidon was not so well-disposed toward another famous hero. Because Odysseus blinded the Cyclops Polyphemus, who was Poseidon's son, the god not only delayed the hero's homeward return from the Trojan War but caused him to face enormous perils. At one point he whipped up the sea with his trident and caused a storm so severe that Odysseus was shipwrecked. Poseidon similarly cursed the wife of King Minos. Minos had proved his divine right to rule Crete by calling on Poseidon to send a bull from the sea, which the king promised to sacrifice. Poseidon sent the bull, but Minos liked it too much to sacrifice it. So Poseidon asked Aphrodite, the goddess of love, to make Minos's queen, Pasiphae, fall in love with the bull. The result was the monstrous Minotaur, half-man, half-bull. As god of horses, Poseidon often adopted the shape of a steed. It is not certain that he was in this form when he wooed Medusa. But when Perseus later killed the Gorgon, the winged horse Pegasus sprang from her severed neck. Poseidon sometimes granted the shape-shifting power to others. And he ceded to the request of the maiden Caenis that she be transformed into the invulnerable, male warrior Caeneus.